The City of Wyoming completed the connector from the Wyoming Recreation and Family Aquatic Center to Oak Park in 2017. 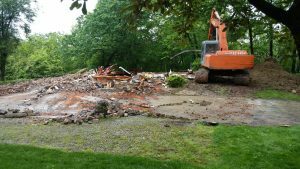 A critical piece to adding the nearly 1 mile Hike/Bike Path connector to Oak Park was the demolition of a home at 1062 Oak Avenue by the Hamilton County Landbank. Early in the community’s planning process, access from the rec center to Oak Park was identified as a priority. One of 21 cities within Hamilton County, the City of Wyoming is a residential community that encompasses 2.8 square miles including a “downtown” business district along Wyoming Avenue. Wyoming offers the advantages of a small town with easy access to the amenities of Cincinnati. As a Village at the time, the first Master Plan was adopted by the community in 1946. Wyoming residents and the city’s government continue the tradition of strong community involvement; mobility and building the hike/bike trail have been a long-time priority, dating back to the City’s 1997 Master Plan. The trail plan was adopted by the City in 2002 and grants for construction were sought. The first leg of the trail was completed in 2009, largely with grant funds. JMA Consultants Inc. provided an analysis of various routes the Hike/Bike Trail extension could travel between Oak Park and the recreation center. At JMA’s recommendation, the Wyoming Community Improvement Corporation purchased 1062 Oak Avenue in order to facilitate a route that could keep construction costs manageable and ensure the Hike/Bike Path was not adjacent to a busy street. The home was rented for several years in order to recoup some of the purchase price while the City sought grants and funding to build the trail connector. 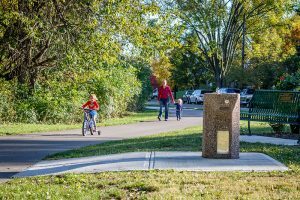 In 2017, the City secured a $303,750 Clean Ohio Trails Fund (COTF) grant from the Ohio Department of Natural Resources, which offset a significant portion of the $478,336.00 overall project cost to extend the trail from North Avenue to Oak Park. Additional land, needed to complete the section of the trail that this leg ties into, was donated by Anchor Brothers Properties Limited. Great Parks of Hamilton County also provided support for the project by authoring a letter indicating that that section of the trail was key to the overall trail system that will connect regional parks, local parks, residential areas and business districts in central Hamilton County. This advocacy assisted Wyoming in obtaining the COTF grant. The City of Wyoming donated the property to the Hamilton County Landbank with an agreement that the home would be demolished through the Neighborhood Initiative Program (NIP) of the Ohio Housing Finance Agency. The Landbank administers NIP in Hamilton County and 406 housing units have been demolished or are under demolition with the funding through the end of October 2018. While the home was vacant, the Wyoming Fire and EMS Departments held dynamic entry and various fire training exercises – providing valuable, hands-on experiences for first responders in a real home setting. After the home was demolished, the City was able to begin construction of the path and the land was transferred back to the City of Wyoming. 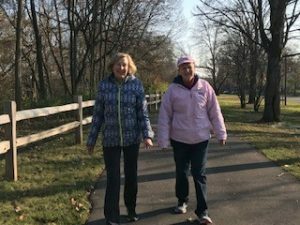 Mary Jo Peairs sees many people using the trail during her daily walks, especially in the afternoon there are children and families walking home from the Vermont Primary School on the new connector section. She and Mert walk on the trail together several times a week. Mary Jo often watches her four year old grandson and one of their favorite activities is riding bikes on the trail and stopping at the playground adjacent to the trail. “My grandson and I are very enthusiastic bike riders. He’s proud that his bike doesn’t have training wheels. We’ve ridden together all the way to Glenview Gardens. I really appreciate that we have a safe, easily accessible place to get out and enjoy the outdoors,” she shared. The Wyoming Hike/Bike Trail is part of the Mill Creek Greenway Trail, which is included in the Hamilton County Regional Trail Network. The regional network ultimately will total 175 miles of connected trails.